A unique mix of Disney and Square Enix characters join spiky-haired hero Sora on his epic journey to save multiple worlds from the evil of the Heartless and find his lost friends Riku and Kairi. Kingdom Hearts is an action RPG published and developed by Squaresoft, and produced with the cooperation of the Walt Disney Company. The game incorporates many characters from Disney's animated works and several of Square Enix's Final Fantasy games. 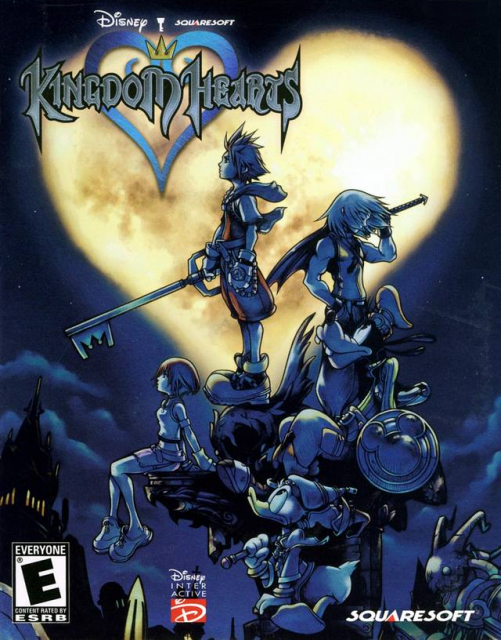 Kingdom Hearts sold 5.6 million copies worldwide (It was Square's highest selling PS2 game in North America) and was critically acclaimed for incorporating the two distinct worlds of Disney and Final Fantasy into one entertaining game. The game's story revolves around a young boy named Sora, who lives on an island with his friends, Kairi and Riku. Their ordinary lives are interrupted when dark creatures called the Heartless attack their island. Though his own home is destroyed, Sora soon learns that he has been chosen to wield the keyblade, the only weapon that can prevent the Heartless from consuming entire worlds. Sora ends up in Traverse Town, where he joins forces with Disney representatives Goofy and Donald Duck in an effort to stop the Heartless from exerting their wrath upon other worlds. The gameplay in Kingdom Hearts combines Final Fantasy-style RPG elements with action-oriented combat that allows the player to take direct control of Sora while two CPU-controlled characters attack based on behaviors set by the player. While Donald and Goofy usually fill out the party, they can be swapped out at save points for other characters that live in the areas Sora is currently visiting. Jack Skellington, Beast, Simba, Tarzan, Aladdin, and Hercules can all join the party when in their respective worlds. The three main characters can be divided into traditional JRPG archetypes with Donald as a mage, Goofy as a tank, and Sora somewhere between the two depending on choices made during the introduction. Early on the player will be asked a set of questions based on their personal fears and aspirations, with each answer determining both bonus stat attributes (Strength, Magic, etc) and the rate at which experience is earned. In addition to the standard array of RPG spells, Sora also has access to another Final Fantasy staple: summons. Instead of summoning creatures from classic mythology, however, the player has the ability to call in characters from classic Disney films. Genie, from Aladdin, Simba, from The Lion King, Mushu from Mulan, Tinker Bell from Peter Pan, Bambi from Bambi, and Dumbo from Dumbo all make appearances. Kingdom Hearts also served as a who's-who of latter day Final Fantasy games, with heroes like Cloud, Squall, and Yuffie making notable appearances. The secret boss Kurt Zisa was named after a contest winner held by Square in the US to promote the game. There are 4 secret bosses: Sephiroth, Kurt Zisa, Phantom, and the Ice Titan. At the beginning of the game, Sora is asked to choose either a sword, shield, or a staff. Each has a different advantage for the player throughout the rest of the game. Choosing the sword maximizes Sora's starting Strength rating, while the shield and staff maximize their starting Defense rating, and Magic (MP) rating respectively. Following this choice, the player must sacrifice one of the remaining two options. Below is a table of all the combinations of starting attributes. Note that AP is short for Ability Points, and MP is short for Magic Points. Following these choices, the player must also answer three questions from three of Sora's friends, Selphie, Tidus, and Wakka. There are three possible answers to each question, and the pace at which Sora levels up is based on the player's answers. Choosing the first answers will allow Sora to level up through lower levels (1-50) quicker than higher levels (51-100). Choosing the third answers will allow Sora to level up through higher levels quicker than lower levels. Choosing the second answers will allow Sora to level up steadily at an even pace throughout the game. Below is a table of all the possible answer combinations and the result they yield. "Your journey begins at dawn." "Your journey begins at noon" "Your journey begins in the dead of night"
"A spirited youth. He was cast into an unknown world when a swarm of Heartless raided his island. He battles the Heartless with a mysterious weapon called the Keyblade as he searches for his friend Kairi." "Captain of the royal knights. He avoids fighting whenever possible. Mickey's most loyal subject. He sets out in the gummi ship with Donald to find King Mickey. He has joined forces with Sora, obeying Mickey's command to follow the key bearer." "Royal magician. Skilled in magic, but can be short-tempered and stubborn. He set out in the gummi ship with Goofy to find the king. Donald has joined forces with Sora, the key-bearer alluded to in the king's letter." "Islander. A self-confident youth always competing with Sora. He hated the monotony of island life and built a raft with Sora and Kairi to explore the outside world. Riku seems to have vanished along with Destiny Islands." "Islander. Kairi, Sora, and Riku were best friends. They built a raft to sail out and see new worlds. The three were separated when a mysterious force struck the Destiny Islands. Thus did Sora's search for Kairi began." "King of Disney Castle. He has set out to learn more about the darkness and left instructions for Donald and Goofy to find and follow the key bearer. No one knows where King Mickey is now, but they are determined to find him." "That's me! The cricket who keeps Pinocchio to the straight and narrow. I'm along on the quest as the royal chronicler." Also called 'International version', this game features the original Kingdom Hearts game along with the updates the countries outside of Japan got (including English voiceovers). But also has more content added specifically to this version for the patient Japanese players. So in short this game adds new cutscenes, new enemies, new keyblades and abilities for Sora, and new aspects to the game including the Ansem reports. While the Playstation 2 version of Final Mix was only released in Japan, the Final Mix version is included in Kingdom Hearts HD 1.5 Remix for Playstation 3 which will be released in North America and Europe as well as Japan. The story in Kingdom Hearts Final Mix remains largely unchanged, although a few additional cutscenes were added to further advance the plot towards Kingdom Hearts II. These creatures look like your average regular Heartless but just a tiny bit bigger. They'll show up in the Bizarre Room after you defeat three waves of regular Shadows. Note: This is only after you've defeated the Trickmaster. If you can manage to kill them without getting hit, they'll drop the Fighting Spirit synthesis item. A new variation of the regular soldier class Heartless was added to Final Mix and consequently the HD 1.5 Remaster. They'll show up at the Keyhole area in Hollow Bastion. They appear to be slightly bigger than their cousins. Using any variation of the "Stop" spell will help you defeat them. Bears resemblance to the Red Nocturne, Blue Rhapsody mage-like Heartless. This one primarily shows up in the Deep Jungle world, the area next to the Camp Tent. The battle with Black Ballade is one of guessing and having good eye coordination. He'll summon several reflections of himself, it's up to you to attack the real one. The real one will do a little skip, before he shuffles among his clones. The easiest way to tell him apart is to constantly pause the game as it makes it easier to follow along. Should you get it right with all of your attacks, you'll rewarded with rare stones for item synthesis. These little bastards bears resemblance to the ordinary Bouncy Wild Heartless from Deep Jungle. They will only spawn in Traverse Town however, and they are relentless depending on your approach. The idea is to now allow this Heartless to spot you before you kill it. This means you'll need at least a fully upgraded "Stop" spell to destroy them properly. The big brother to the ordinary Pot Heartless of Agrabah. Pot Scorpion will appear at the Palace Gates of Agrabah. He's hidden inside one of several pots placed in front of the gates. The idea is to destroy as many of the empty pots before you get to the Scorpion. The best way to do this is run into all the pots, if the pot moves then it's empty. The only way to fight and destroy the actual scorpion is to parry his attacks, leaving him wide open to a counter attack. He'll generally award you with rare synthesis items. When he's feeling generous, anyway. A slightly different coloured version of the Search Ghost. He'll generally spawn inside Monstro in the room where you fought the Parasite Cage. Ironically, the only way to destroy this Heartless is to heal him with healing items. Using expensive items like Elixirs will net you better rewards. Not to be confused with the creature of myth. Its name is derived from the meaning behind the word "Chimera" as in a creature that is made up of several other creatures. This is one of the few unique designed Heartless among all the newest added enemies. It'll spawn at the location where Oogie's manor used to be after you destroyed it, you jerk! Not much real strategy is required for this one, just make sure you have a decent enough defense then whack away on this fool. Looks similar in appearance to that of the Aquatank of Atlantica. This Heartless is particularly tough to hit while in the air. The best way to work around his dangerous offensive attack is to use Aeroga. It'll make relatively easy to close into the target. Arguably among the coolest designed Heartless in the series. They first got their debut in the Another Side, Another Story secret ending of the original release of Kingdom Hearts. Square has since introduced the popular Heartless iteration into the Japanese-only Final Mix version, and of course the later released 1.5 HD Remaster. They look and act like their younger siblings, but are much more agile and dangerous. They spawn in the room just before you fight Ansem. The strategy to beating them is to simply whack them like any other Shadow! This big-boy mushroom heartless will only spawn in a specific location in Deep Jungle as well as Atlantica. To summon him, simply cast Stop on all three White Mushroom heartless in the area. They can idenfied as being a constant freezing pose, that way you'll know you got the right ones. Once he is summoned, the real challenge begins. Much like the other 'shroom-looking Heartless, this one presents you a challenge. He'll drop one of the best defensive equipment items in the game, should you manage to get a 100 hits in on him. He'll drop Serenity Power needed for the Ultima Weapon if you got at least 40. Getting Serenity should be simple, if you have Stopga, Aeroga and Ragnarok. It's the full set that is tough, even with all of these things in order. With the 1.5 HD Remaster, it should be easier to land Ragnarok on this fool very easily, as well as Donald and Goofy not attacking. Japan gets to fight new bosses but also the ones that weren't included in the original Japanese version but that was in the American one (like the Ice Titan, Kurt Zisa and Sephiroth). The new boss was originally named "Unknown" or the "Enigmatic Man" who is later revealed to be Xemnas in Kingdom Hearts II. The fight can be accessed in Hollow Bastion at the end of the game, and is considered one of the hardest, if not the hardest boss fight in the game. He comes to test Sora's power, and remarks that he looks just like "him" (who the player learns to be a reference to Roxas). The best way to beat him and by-pass his one hit-kill move is to come packed with lots of MP Rage and MP Replenishing abilities for Goofy. Then spam the living hell out of him with Strike Raid. The old Heartless bosses from the original game has also comed packed with different colors and higher stats like their health or their magic points. This works for every enemy in the game and does increase the level of difficulty. The game adds new cutscenes including a new secret ending for all to enjoy!. The secret ending we all know now shows Riku and Roxas fighting in the World that never Was and the other cutscenes concern Cloud and Sephiroth as Sora sees them fight and Riku in the two others in which he is in a flashback along with Sora and another talking to King Mickey. Some conversations have been added to the game including one in which Aeris explains to Sora what Cloud is looking for. Sora can obtain 2 new keyblades to fight with. They are obtained by defeating Sephiroth (One-Winged-Angel Keyblade) and the other for defeating the Ice Titan (Diamond Dust). There is 2 new Ansem Reports which can be unlocked for more information on Ansem and the way he saw the world. Those reports are greatly appreciated by fans as they give a good explanation on the story and give the player enough facts to start speculating about a next Kingdom Hearts. Unlike the PS2 version of Final Mix, which used English voiceovers and Japanese text, the Japanese HD version will use the original Japanese voiceovers. The North American version will have only English voiceovers while the European version will have voiceover options in English, French and German. Cutscenes can now be skipped, should the player choose to. Kingdom Hearts 3D's models are used for certain characters including Sora. Zero EXP ability has been added. When active players won't gain experience. This means players should be able to play though the entire game at Level 1. Combo Master ability has been added. This allows the player to continue a combo even if a part of the combo doesn't connect. Abilities that were in the fourth menu option are now used via the triangle button akin to the reaction commands in Kingdom Hearts II. Summons are now broken out into their own spot in the command menu, taking the fourth menu slot's place.